Ralph Bartlett mentions the Hutt River Province, originally a principality (from 1970), but in 1980 upgraded by Prince Roy to a Kingdom. Unfortunately, no mention of a flag. There is also mention of four other "states" like this in Australia. Hutt River Province came to beeing on the 21.april 1970. They seceded from the Commonwealth of Australia by Leonard George Casley who became the sovereign Prince, when the status was altered from a Republic to a Principality to gain benefits in law as a principality. The sovereign is: Prince Leonard and the Prince regent is: his eldest son Prince Ian. 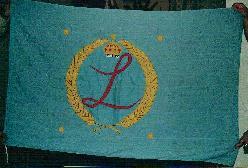 The flag is blue with the coat of arms of the province in the centre. The coat of arms shows the head of a bull, a scale and a eagle. I was told by HRH Prince Leonard that this standard travels with him when on Offical Tours in foriegn countries. I was last flown at the Perth Sheraton Hotel when HRH was a guest of the US Consul on the 4th July 1998. A British Blue Ensign defaced with a map of Australia in the fly in gold. The map appears directly on the blue and is not on a roundel or disc. This flag, described by Brendan Jones seems to be the one of another self-proclaimed country in Australia, the Province of Bumbunga. The only addition to the description given, would be that a blue dot appears on the map where Bumbunga is located (close to Adelaide). By the way, Tasmania is not included on the map. The flag was adopted in 1976. My source for this information is an article by Ralph G. Bartlett called "Province of Bumbunga. Study of a Self-Proclaimed Independent State within Australia", pp. 68-77 in the Report of the XI International Congress of Vexillology (Madrid 1985).